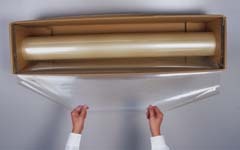 The perfect barrier film for high performance packing. Sealable with impulse sealers or constant heat sealers (PE-side to PE-side). Other types of film upon request. For pouches made of aluminium barrier film click here. The films 20T and 30T are authoized for contact with nutritients (click here) and comply to standards DIN 55531 and NF-H-00310. Tensile strength, long. / large >50 N / 15 mm 76,2 / 73,5 N /15 mm 85 / 90 N /15 mm n.a. Seal strength >35 N / 15 mm 40 N / 15 mm 50 N / 15 mm n.a. Oil-proof n.a. yes yes n.a. ESCAL film, transparent, sealable oxygen barrier film with low oxygen permeation rate. Composition: PP/ceramic deposited PVA/PE. Often the most economical solution is to seal bags using ESCAL for the front side and aluminium barrier foil for the back side. For pre-fabricated bags click here. Transparent film with excellent barrier characteristics for oxygen. 400 cm wide! Folded fourfold to 1 m width, for easy shipping and handling. 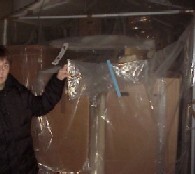 Great for anoxic bubbles for museums or warehouses, sealable from both sides and not curling. The barrier performance is largely sufficient for anoxic treatments. For anoxic treatments with oxygen scavengers we recommend to use the film in double layer in order to minimize risk of mechanical damage. Sealable with hand held sealers - we recommend to seal a double seam with Polystar 300D. Oxygen permeation < 2 cm3/m²/day/atm (23°C, 75% RH). Sealing time : 1 sec. Cheap and sturdy film with good barrier performance for water vapour. Can also be sealed onto aluminium barrier film, TYVEK or other non-wovens. Vapour permeation will be higher at higher temperatures! in rolls of 100 lin.m. Normally all sizes are in stock!